Machame is known as the most scenic route to the summit. With alternating paths to the summit and back, along with a circumvention near the peak, you get to see different sides of the mountain including high alpine deserts, ice fields, and of course the peak. Machame begins in the magnificent rainforest and climbs to a ridge leading through moorland to the Shira Plateau. It offers great scenery beneath the Southern Icefields before summiting from Barafu Camp. To climb Kilimanjaro on Machame with my personally recommended operators, go here (African Walking Company) or here (Ultimate Kilimanjaro). After breakfast, we drive approximately 1 hour drive to the village of Machame. Depending on the condition of the road, it may be possible to drive 3km further from the village to the Machame gate of the Mt. Kilimanjaro National Park (1815m). After registering at the gate office, you start your ascent and enter the lush rain forest. Here, you will listen to the sounds of many exotic birds, and may evensee monkeys such as the black & white colobus – these monkeys are black with a long cape’ of white hair and a flowing white tail. Most of today’s day is spent in the gorgeous and fascinating forested slopes of Mt. Kilimanjaro, most of which is considered to be rainforest zone. It is very possible that we will see some rain today, or that at least the trail will be moist and soggy, and possibly muddy. We cover a lot of distance today, though the gradient is gradual. We climb the lower slopes of the mountain, ending at the Machame Campsite, just beyond the rain forest and within the fascinating heath-land. Rise early and climb steeply through the heath land of savannah, and trees such as Giant Heather and Erica. You will reach a gentler ascent through the lower alpine moorland, which is notable for beautiful wild alpine flowers and the unique giant lobelia and giant groundsel (senecio kilimanjari) plants. If its a clear day, you will have direct views of Kibo, the peak and ultimate goal of your adventure. After a short lunch and rest, traverse across the Shira plateau west towards a river gorge, and finally you will reach the Shira campsite. The night at this exposed camp will even be colder than the previous night, with temperatures dropping to well below freezing. Today we turn east and continue to climb pole pole (slowly, slowly) through increasingly rocky and barren terrain. We have lunch and ascend the rocky scree path to the Lava Tower (4630m). The trek now starts to become more difficult, as the trail steepens, and most hikers start to feel the affects of the altitude, such as weakness and lack of breathe. From the Lava Tower, we descend steeply for 2 hours down more than 600m into the Great Barranco Valley. This descent affords fantastic views and some great photo opportunities of the Western Breach and Breach Wall. You will also feel here the clear benefits of this acclimatization day as we lose altitude down to the camp. Barranco Camp is set on a col (flat area) enclosed on three sides by the Breach Walls, and the Kibo massif itself. Hanging glaciers glint in the sunshine above, amidst the eerie landscape of plants such as the giant groundsels, and the uniquely endemic Giant Lobelia. This is definitely the toughest day so far, but incredibly beautiful. Today we tackle the Great Barranco Wall, an imposing face above your camp. A steady climb up the eastern wall takes us just below the Heim Glacier, where we may have some awesome views of Kilimanjaro. Our trail continues down into the Karanga Valley. 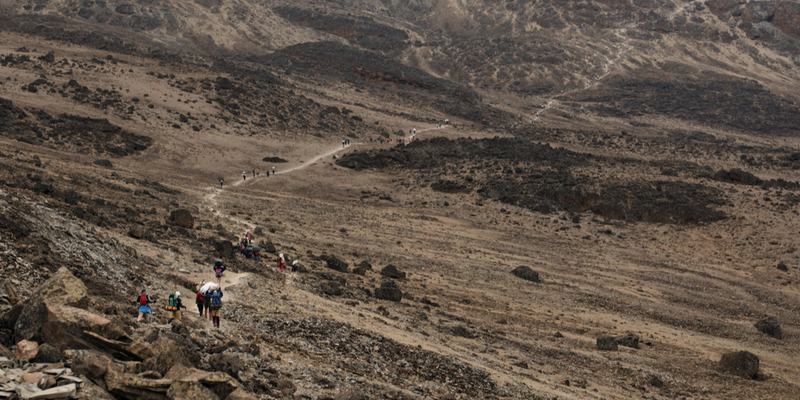 We follow the trail climbing through an empty and dry landscape up to Barafu Camp. The two peaks Kibo and Mawenzi can been seen from our camp. 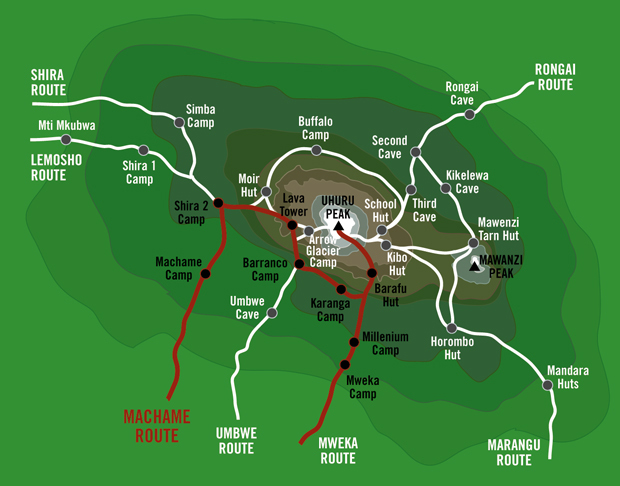 Barafu is the Swahili word for “ice”, and the camping area is on a ridge in an narrow and exposed flat area. Here there are ever-present gale winds that come off the mountain peaks. In preparation for your final ascent the same night, you will familiarize yourself with the terrain before dark, and prepare your equipment and thermal clothing for the summit attempt. Sleep may be difficult, but you will lie down after dinner to rest for the 1345m final ascent. Today you will be woken at approximately in time to leave camp by around 12am, and after a warm drink and a light snack, you will begin the most difficult though most rewarding day of the trek your hike up to the top of Africa. Climbing through the dark, you will ascend northwest on rough scree passing between the Rebmann and Tarzel glaciers. After approximately 6 hours of slow but strenuous hiking, you will reach the rim of the main crater, Stella Point, at 5685m. It is here where you will be rewarded with a breath-taking sunrise (weather permitting), which we enjoy while taking a short rest. From Stella Point the trail is normally snow-covered, and every step of the 3 hour ascent to Uhuru peak is challenging. At 5895m, Uhuru, which means freedom in Swahili, is the highest point in Africa. Take a few minutes to appreciate your accomplishment, as this is day to remember for the rest of your life! The time you will spend on the summit will depend on the weather conditions; the temperatures range from just below freezing at midnight, to between -12 C to -23 C just before dawn. We start back down the same trail, and descend back to Barafu camp. Here you will have a well earned but short rest and collect the rest of your gear. We then head down the rock and scree path into the moorland zone, reaching the forest, and eventually arriving at Mweka hut in the late afternoon. Today is the longest, and the most mentally and physically challenging of the trek. But a day that will stay with you forever, as you conquered the heights of Kilimanjaro. At a much lower altitude than the last few mornings, today you will wake up full of oxygen and ready to descend the short hike to the Mweka Gate. Enjoy the forest on the slopes of Mt. Kilimanjaro, and upon arrival at the Mweka gate, successful hikers will receive their summit certificates (gold for Uhuru Peale, Green for Stella point). From the Mweka Gate you will continue down into the Mweka village for lunch, normally a muddy 1 hour hike. Upon arrival to Moshi in the afternoon, relax, or have that much-deserved shower and congratulatory beverage.